This one is the last WiP and final obstacle before I begin my labor-of-love afghan with my amazing new wool. It has been picked up and put back down probably 50 times over the past 6 months. And yet I am no further than this. I can’t seem to get into an old-school sc chevron/ripple. But I absolutely adore the colors, and I really want a footstoolish-type pillow. I even have the foam form. This is getting frogged. On second thought, no. Yeesh, I should have saved the best WiP for last instead of this one, the slowest and most aggravating. Yikes. Very scary inside my head isn’t it? I have finished or frogged bunches of half-baked projects in the past month. I’m not allowing myself to move on until I’m all caught up. And I’m only talking about yarn projects. I prefer to live in denial over all the other partially finished crap in my magical craft closet. You are too funny! I think your “boring” WIP is very pretty but I do understand what you mean. I’m working on a project now that I’m anxious to finish so I can move on. You have a Magical craft closet? How does it work? You need it to magically complete the projects that you don’t want to finish? Magical indeed. Only not quite as magical as one would wish. And thanks for the vote of confidence on the WiP, I was still wavering but have decided NOT to cut it from the team. I will trudge onward. Do as a friend suggested to me when I spoke of a boring repetitive stitched project ,,, she said time to pop something in your ear music or story and stitch on! Music does make the world go ‘round Andi. It also drowns out boys and husbands. Good plan! 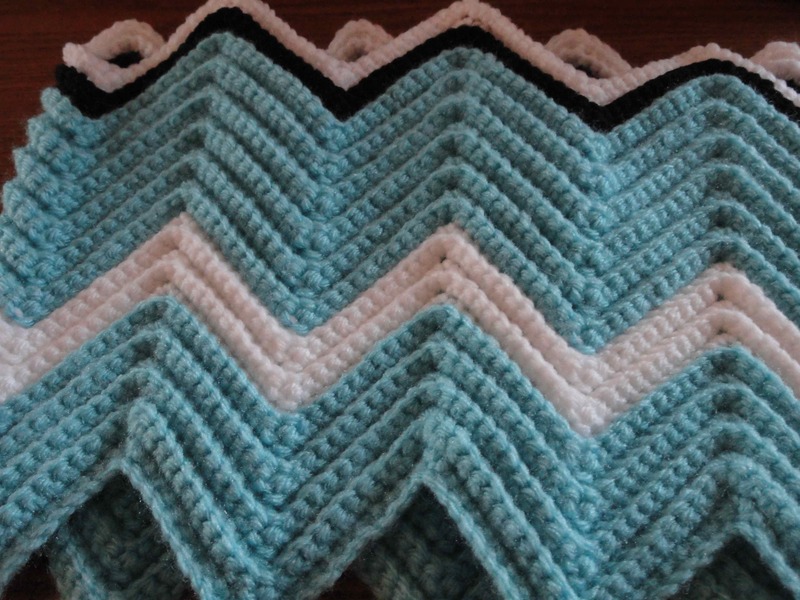 I love the chevron pattern… will be starting one soon… Can you tell me how many skeins it takes for a kingsize? Say, 5 colors? Wowsers! What a undertaking you are doing 🙂 In my opinion, I would probably go with about 16 – 18 skeins depending on your stitch, hook and pattern. If you want to do that on a budget, you could get 6 or 7 of the pounder skeins, and the bonus is that they are usually no-dye-lot, and you can get the 50% off coupons at JoAnn’s and you can buy them as you go. Good luck 🙂 I would love to see your finished project!